Today I'll be sharing what I've decluttered since my last update in early November. By doing these updates I hope to give you ideas of things you can purge from your home! Much of my decluttering during this period has been documented throughout the #NetZeroClutter series, so after I talk about what I decuttered in November, I'll wrap my totals for the whole year. However, as part of the process, we had to empty everything off our garage floor, which included our huge shelf that we store all our bins on (the supports rested on the actual floor). Most of those bins and a lot of other garage stuff lived in our dining room, living room, hallway, and basement for about 6 weeks (it took longer than expected to do the floor and then we did some repairs and upgrades ourselves). We called it temporary clutter. But boy it sure seemed like a long 6 weeks! Anyway, although I thought we had decluttered our garage fairly well over the last few years, by touching every single thing (even things shoved back in the corners! ), we still found some items to declutter. That's 16 items decluttered in November. There was probably more, but in our rush to empty out our garage I didn't take pictures or record any of it and this is all I remember. I didn't declutter much else in November because our home really was taken over by items from our garage. Once it was all finally moved back into the garage at the end of November though... I was ready to do some serious decluttering! 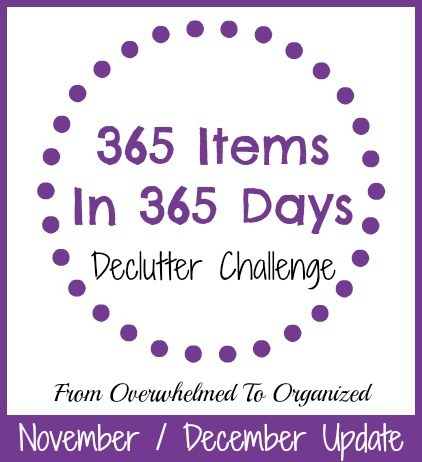 I decluttered 553 items in December during the NetZeroClutter series! After factoring in 194 items that entered our home this month, I ended up with a total of 359 net items out of our home. If you weren't following that series, you can go back through the posts to see what I decluttered. Sometimes I followed the category for that day's post and sometimes I just decluttered things that I wanted to tackle. Note: My NetZeroClutter decluttered items total is higher than what I would normally have counted for the 365 Items in 365 Days challenge. I counted 100 items of kids' clothing and normally I don't count those in the 365 Items in 365 Days challenge. So I'll make that 3 bags of clothes instead of 100 items, which makes my total 456 items in December for this challenge. All totaled, that makes 472 items decluttered in the last two months. That's a total of 1104 items decluttered in 2015! Wow! It never feels like very much as I'm doing it, but that's one of the reasons I like keeping track of what I declutter. It's so motivating to know I decluttered over 1000 items this year from our home. That beats my total from 2014 too :) And now I've upped the ante for 2016! In our Facebook group, we've had lots of activity lately! 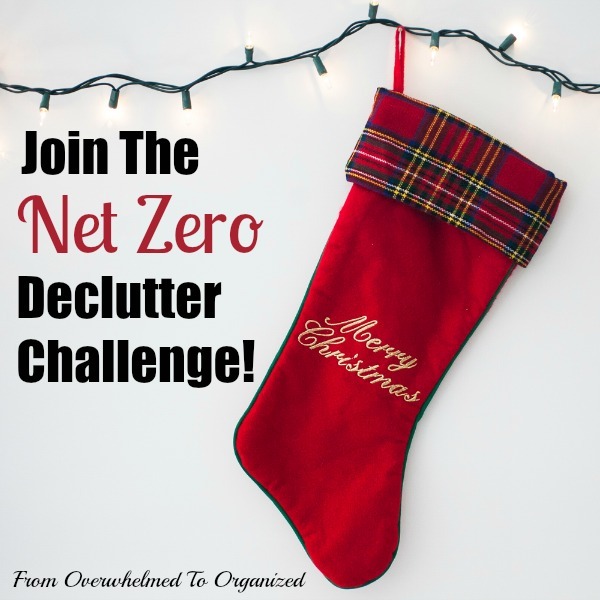 We had a lot of new members join us for the #NetZeroClutter challenge as well as just in the last few days as people are ready to get a jump start on decluttering and organizing for the new year. Come join us if you need some motivation and cheering :) The details for this challenge are always in a tab at the top of the page here on the blog. So, that's my decluttering journey for the last few months! 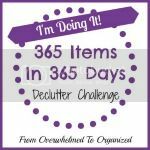 I'm so glad you're part of the 365 Items in 365 Days Declutter Challenge and I hope this post gives you some ideas of what you can purge next! If you haven't joined yet... jump in! January is a great time to let go of things so you can start the new year off on a lighter note! What did you declutter this month? 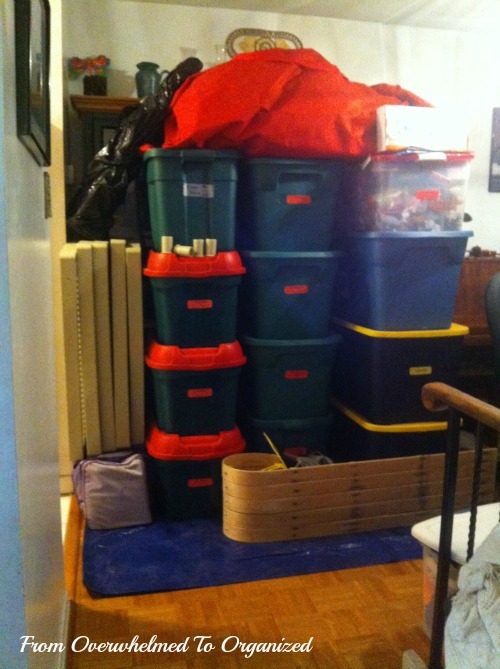 Do you have clutter you want to purge to kick off the new year? Have you joined the 365 in 365 Challenge yet? Thanks Jill! Good job moving the beds :) Once your home is back to "normal" you'll be able to do more decluttering!